Thank you to all who participated in our Maker of the Month contest! We got some great submissions from creative people all around the country. It wasn’t easy to choose a winner. The winner is… Tom Wisk from West Chester, Pennsylvania! 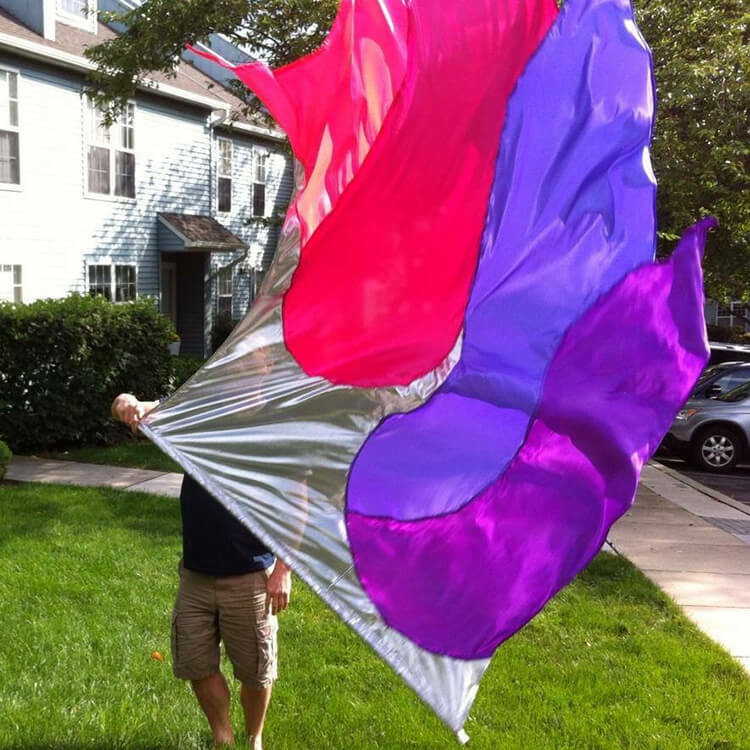 His submission was one of the many flags he makes for color guard groups. Scroll down to learn more about Tom and his sewing projects. 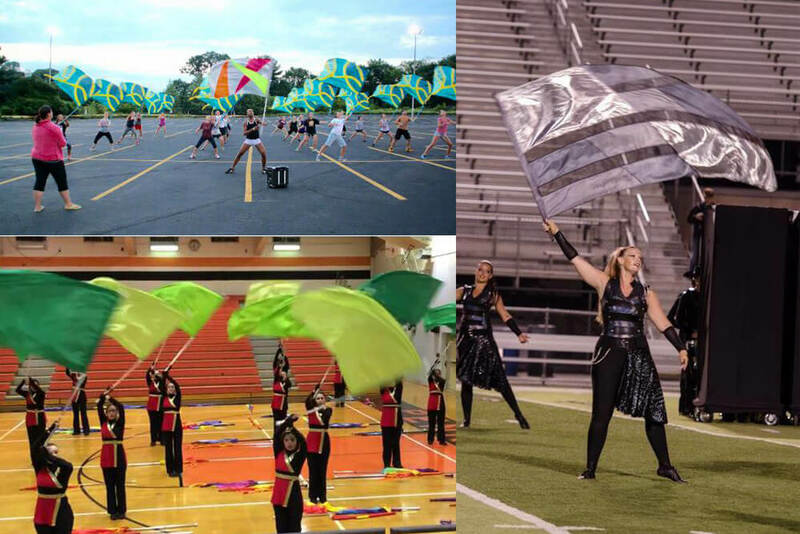 How did you get into the world of color guard? TW: I started my interest in color guard my senior year on HS when I watched a performance of the indoor group. I then went on to perform with independent groups (Drum Corps and indoor groups). How long have you been making these flags? TW: I taught myself how to sew when I was very young on my grandmother’s sewing machine. It all began with a simple straight stitch hemming pants, eventually moving on to other items around the house. 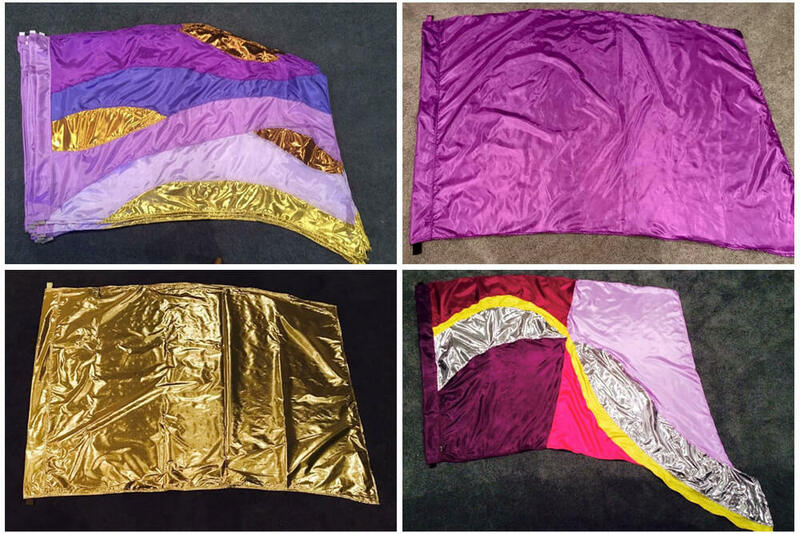 When I began to teach marching band in 1987 I made my first set of flags for the color guard to save them money. Eventually I began sewing flags for other groups and started to be known as “handmade by TOMMY“. My sewing reputation, mostly established by word of mouth, has brought me flag orders from all around the country. How long does it take to make 1 flag, or a set of flags? TW: The amount of time to make a flag varies depending on the design and quantity of pieces involved. I actually have adapted a form of “chain sewing” where I will sew the same seam on the set before moving on. A group could have anywhere from 5 to 30 members. Some high school marching bands and college bands could have 50-60+ members. What is your creative process for coming up with the designs? TW: Most designs come directly from the staff of the programs as a sketch or sometimes a description and color options. I have also created my own designs. Sharper, straighter edges in the design can help portray a more aggressive feel, while softer curves or “warm & cool” colors might be used for a ballad or slower piece. You also need to take into consideration how the design will look spinning and what you want your eyes to draw into while it’s moving. The design is sketched in a full size paper flag pattern and cut out. I then use those pieces as patterns to cut fabric choices and reassemble it on my sewing machine similar to what a quilter would do. Are there any things in particular that you need to keep in mind when making a flag, like the weight of the fabric or how it will flow? TW: Normally the “theme” of the program that season is the driving force for the pattern choice. Other factors involve coordinating with the costume choice, musical selection and/or how it will contribute towards the required impact or drama for effect. Different fabrics can add accents or additional textures. Most flags use a lightweight lining fabric like China Silk (or Habutae). Other fabrics to use are Tissue Lame, Chiffon, and Organza. Adding more seams to the flag can cause more drag as they spin, so seam direction as well as fabric choices are always considered. Over the years, the industry of pricier digitally printed flags has evolved. Although quite beautiful laying out on the ground, visually the image can become hard to see once the color guard begins to spin them. While some prefer digital vs. sewn, there will ALWAYS be a market for a quality sewn flag. How did you hear about Online Fabric Store? TW: I came across OFS while searching various outlets and suppliers online. Once you know what types of fabrics you require it’s easy to do some searching online. I have found that OFS has satisfied my flag sewing needs as well as fabric options for many different projects. As a prize for winning this contest, he received a $100 gift certificate to Online Fabric Store. Some of his work will be featured on our Facebook and Instagram profiles, so make sure to check back in to our social media pages. Honorable mention goes out to Deborah Norrod and Viktoria Mitiliuk, whose submissions can be seen below. 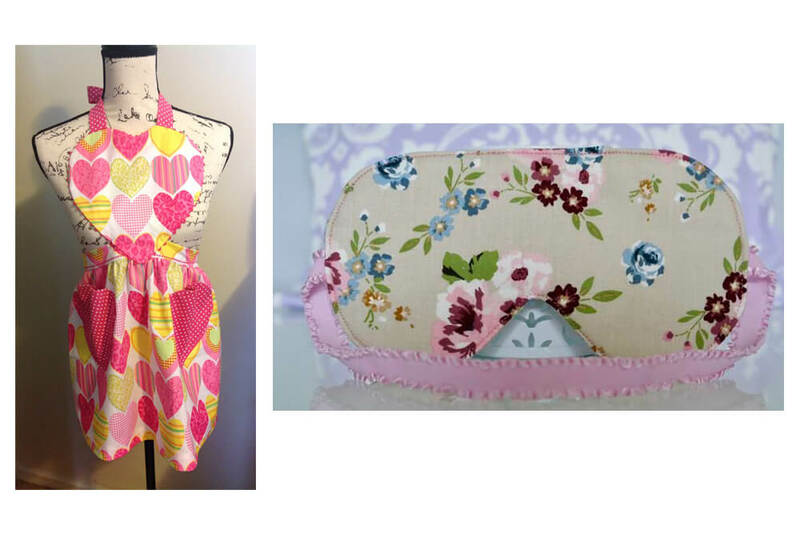 Deborah sewed a lovely cotton print apron, and Viktoria submitted a handmade sleep mask. Check out the "handmade by TOMMY" Facebook page.